Jewish Humor Central: It's Time For You to Choose: Which Chanukah Music Video is Your Favorite? It's Time For You to Choose: Which Chanukah Music Video is Your Favorite? Since we started our Chanukah countdown, we've posted 12 new music videos that were created for this season. Some were by groups you've seen before, and some were first time creations. They covered a wide range of music styles, and they were sung by boys and girls, men and women, young and old. 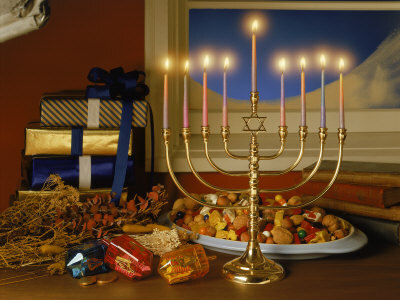 Here's an opportunity for all of our readers to get involved, take another look at the songs as we get ready to light the eighth Chanukah candle, and vote for your favorite. Only one vote can be cast, so choose carefully. Just make your selection in the column at the left of this blog post. We'll be collecting votes for a week, ending at midnight next Monday, January 2. Here are links to the videos, just in case you'd like to see them again before voting. Los Angeles Jewish Home: "Chanukah Oh Chanukah"
The Fountainheads: "Light Up the Night"
Luisa Tedoff Cohen: "Hilarious Hanukkah Medley"
Jerusalem Flash Mob: "Shir BaBoker (Pitom Kam Adam)"
Hashmonaim Children: "Kung Fu Maccabees"
Tom Lehrer and Yavneh Choir: "Hanukkah in Santa Monica"
What about Pass the Candle by Michelle Citrin?